We have been supplying & installing windows since 1989 & have seen many changes to the double glazed window in this time, we have always stayed ahead of the market using the most up to date products. ALL OUR WINDOWS ARE “A” RATED AS STANDARD. We are a SafeGuard Profile 22 approved installer and have been for some 10 years, we also install aluminium windows & sliding sash windows manufactured by Kat UK. Both PVC & aluminium products are “Secured by Design”, this is the police accreditation to enhance security in your home. We give a full 10 year parts & labour warranty on all goods supplied and fitted, even on locks & hardware. We only use our own very experienced fitters. Estimates are FREE, ask to see our extensive glass designs brochure. 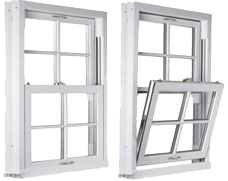 Casement windows are the most popular choice, offering a traditional design in a wide range of styles. Easy clean hinges can be requested for that hard-to-get-at window over the porch or conservatory. 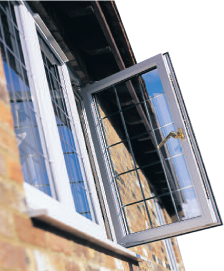 Our modern Tilt & Turn windows offer the unique, secure ‘tilt ventilation’ option, as well as opening fully into the room for easy cleaning. Five colour options are available - two of them in a two-tone finish, meaning you can have the natural beauty of wood on the outside but still bright white within. Unlike some woodgrain finishes available Rosewood and Antique Oak faithfully replicate the grain of real timber - they are often mistaken for the real thing! All our Safeguard windows are internally glazed for extra securit, and fitted with high security ‘shootbolt’ locking as standard. Our key locking handles also feature a lockable ‘night vent’ position for extra comfort. Safeguard is a new concept in window and door design. It's clean, elegant lines won't look out of place, regardless of the style of your property. ‘State-of-the-art’ locking and security systems will ‘Safeguard’ your home and possessions, whilst cutting-edge technology ensures insulation values that ‘Safeguard’ the planet and its valuable resources. In beautiful, stylish and virtually maintenance free PVC-U. So no more painting! Our range of styles also means we can design your windows and doors to complement any home - modern or traditional. Special ‘fire escape’ hinges can be fitted, where necessary, opening wider than standard hinges and allowing you to get out fast in an emergency. Restrictor hinges are also available to further improve child safety. Beautifully designed and highly durable sculptured PVCu profiles create an authentic and long-lasting pristine appearance. The deep outer frame holds two independent glazed sashes which slide up and down past each other in the traditional manner. Modern sash windows work effortlessly using concealed spring balances and they will stay open in any position. You may like to choose this option so that both sashes will tilt inwards to allow easy cleaning of the outside glass from inside the room. 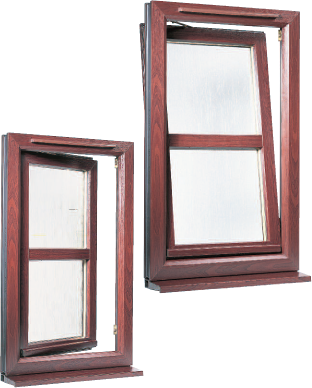 This is ideal for upstairs windows and can sometimes be required by building regulations. Specially designed modern spring balances replace the heavy counterweights of old-fashioned sash windows. They are guaranteed for 10 years and will last at least 25 years having been independently tested to well over 20,000 operations. Each balance is carefully made to the weight of the window to ensure a smooth easy sliding operation. Copyright © 2019 Ian Fenton Design & Build Ltd. All Rights Reserved.